United Miao Football Club won the 2nd Wangnia Pongte Memorial Football Cup 2016 after beating Bordumsa Football Club by 5-1 goals in full time, here at general ground, Changlang, on Thursday. The match which initially, was ruled by Bordumsa FC with its attacks, soon changed its course when Asu Das, left Striker successfully found the net twice in the duration of just one minute at 15th and 16th minutes. Both the teams equally kept the goalkeeper busy with unsuccessful attempts till Wangsu Kamhua of Bordumsa FC succeeded to break the defence line of United Miao FC and scored the first goal for his team at 45th minute. At 73rd minute Asu Das successfully scored his third goal in the match followed by his team mate Rawang Hakhun who scored for his team at 75th minute. Bordumsa FC seemed struggling throughout the match but luck didn’t seem to be with them. It was once again Asu Das who scored his fourth goal for his team at 80th minute and finally sealed the fate of Bordumsa FC. Azad Ali of United Miao FC was adjudged best goalkeeper while Repu Rekhung became the highest scorer of the tournament. Rangrinkan FC was adjudged most Disciplined team of the tournament. Earlier, gracing the closing ceremony as Chief Guest, Changlang ZPC Jowkhong Singpho urged the youth to keep themselves in games and sports activities and refrain from unhealthy activities. Citing examples of successful sports person he said that the youth from the district may also emerge as successful sports person provided keen interest is given with absolute hard work and dedication. Nampang Wangjen remembered Lt Wangnia Pongte and said that it was because of him that Tutsas are recognised as a Scheduled Tribe of Arunachal Pradesh. He exhorted the players to maintain discipline and sportsman spirit while playing. 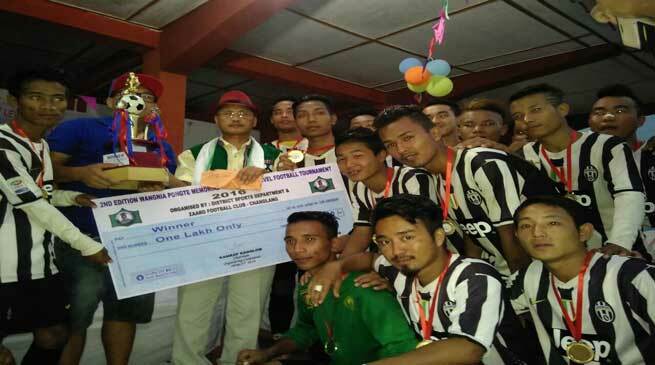 Changlang North MLA Tesam Pongte, the host, informed that the main motive behind introduction of the Football tournament in the name of Lt Pongte was to promote football game in the district and maintain physical as well as mental fitness by keeping them busy during their leisure time. Later, the dignitaries gave away prizes to the winners, runner-up and individual achievers. Chairman of the tournament Kamrup Kanglom and Committee member Shri Wangman Kungkho also spoke on the occasion.